Reigning 1,500m World Champion Jenny Simpson and 2008 Olympic finalist Shannon Rowbury headline an international field in the Women's Wanamaker Metric Mile — sponsored by the New York Road Runners — at the Millrose Games on Feb. 11. Simpson, the only woman in the field to run sub-four in the metric mile, and Rowbury, a two-time U.S. champion, will face emerging Ethiopian star Kalkidan Gezahegne, Canadian Nicole Edwards Sifuentes and Spain's Isabel Macias, all of whom have run personal bests in the last two years. Also in the field is Serbian record holder Marina Muncan, who ran at Villanova, and New Zealander Lucy Van Dalen, who still runs at Stony Brook and has the fastest indoor time among all collegians so far this winter. The remainder of the field is a 'who's who' of former college All-Americans, including Gabriele Anderson (Minnesota), Katie Follett (Washington), Liz Maloy and Maggie Infeld (Georgetown) and Lauren Centrowitz (Stanford). Centrowitz visited The Armory for a workout just after the New Year with her brother Matthew and father Matt. While she is ready to run in the Wanamaker Metric Mile, Matthew will be competing in the Wanamaker Mile at Millrose as well. The 2011 World Champion in the 1,500-meter run in South Korea, Simpson closed her breakout season with a victory in the NYRR Fifth Avenue Mile. 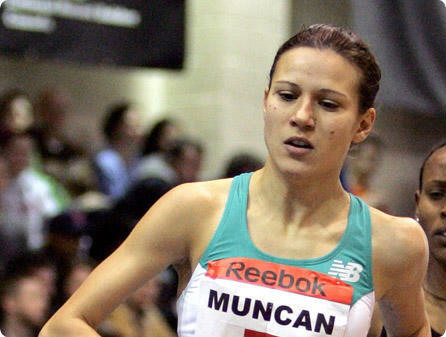 Last year she had opened her year with victory in the women's mile at the New Balance Games at The Armory. A two-time U.S. champion and 2008 Olympic finalist, Rowbury is familiar with the track at The Armory as she ran here while competing for Duke University. Over the summer Rowbury made the U.S. World Championships team with a third-place finish at Nationals. The fifth-place 1,500m finisher at the 2011 World Championships, Gezahegne is the reigning indoor world champion in the event. The Ethiopian was second at the 2009 African Juniors to Caster Semenya. Her indoor 4:03.28 from Stockholm, Sweden, in 2010 is the fastest indoor mark of all the entrants. A standout at the University of Michigan, the native of Canada has run a sub-4:30 mile at The Armory. Macias had a breakout year in 2011, lowering her 800m personal best by more than 2.5 seconds (to 2:03.49) and her 1500m best by 6.5 seconds (to 4:06.50). She also competed in her first World Championships. A 2010 NCAA runner-up in the 1,500m run, Anderson is a graduate of the University of Minnesota. Third in the U.S. Mile Road Championships in 2011, she now runs for Brooks. She is a cancer survivor. An All-American at the University of Washington, Follett lowered her 1,500m personal best twice in 2011. A multiple All-American and Big East champion at Villanova, Muncan is the Serbian record holder in both the 1,500m and mile runs. A New York native from Loudonville's Academy of Holy Names, Maloy was a four-time All-American at Georgetown University. Now representing New Balance, she has lowered her 1,500m PR to under 4:10. A five-time All-American at Stanford, Centrowitz comes from a running family. Her brother Matthew is a headliner in the Wanamaker Mile at Millrose this year while her father Matt was an Olympian. Lauren was also a member of the American record holding 4x1500m relay at Stanford. A Georgetown University All-American, Infeld registered personal bests in both the 800 (2:03.47) and the 1,500 (4:10.57) in 2010. The native of New Zealand remains a student-athlete at Long Island's Stony Brook University. She is actually the NCAA's current national leader in the mile for this indoor season (4:36.90) — by 15 seconds!